David R. Holsinger (b. 12/26/1945, Hardin, Missouri), twice the recipient of the prestigious Ostwald Composition Prize of the American Bandmasters Association, was educated at Central Methodist College [Now Central Methodist University], Fayette, Missouri; Central Missouri State University [Now University of Central Missouri], Warrensburg; and the University of Kansas, Lawrence. His primary composition study has been with Donald Bohlen at Central Missouri State and Charles Hoag at the University of Kansas. David R. Holsinger is an elected member of the American Bandmasters Association. Over the past thirteen years, Holsinger served as Visiting Composer in Residence at thirteen American colleges or universities. In the summer of 1998, the United States Air Force Band of the West featured Holsinger as the HERITAGE VI composer during the Texas Bandmasters Association convention in San Antonio. This prestigious series celebrating American wind composers was founded in 1992 and had previously honored Morton Gould, Ron Nelson, Robert Jager, W. Francis McBeth, and Roger Nixon. This collection of recorded concerts has become, in recent years, a very special addition to the wind music world. Holsinger’s compositions have received kudos in several national competitions. His composition, IN THE SPRING AT THE TIME WHEN KINGS GO OFF TO WAR, won the 1986 ABA-Ostwald Prize. 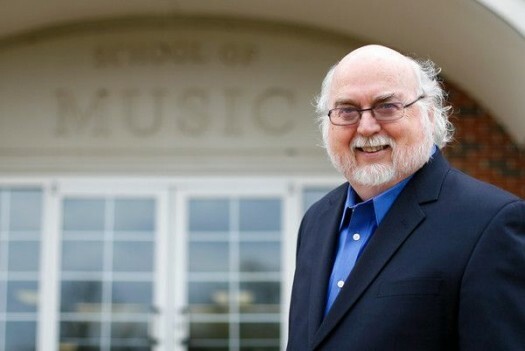 In addition to his university teaching, Holsinger has appeared as guest composer/conductor at over 60 major colleges and universities in the past 10 years and has had opportunity to guest conduct outstanding high school honor bands in thirty-seven states. When not composing or conducting, David plays with his HO Train Layout.